Meidän studiot ja huoneistot sijaitsevat Manhattanin keskustassa lähellä Empire State Buildingia, Times Squarea (15 minuutin k����velymatka), ja l���hes kaikki tärkeimmät matkailukohteet saavutetaan suurten julkisten liikennevälineiden, kuten metrojen ja linja-autojen, sekä autopalvelun ja NYC-taksin kautta. Times Square (12 minuutin kävelymatka): Manhattanin sydän ja sen viihdekeskus. Broadwayn teatterialue on lähell�� ja monet elokuvateatterit, ravintolat, ostoskeskukset ja puistot. Showerhead definitely needs to be replaced. Only 2 towels were provided and they didn’t smell clean. Showerhead definitely needs to be replaced. Only 2 towels were provided and they didn’t smell clean. We bought new ones @nearby target. The location is great but the rentals rate is competitive to similar in the area. We had to clean the kitchen/dishes and take out trash at the end of our stay, yet you still get charged a $70 cleaning fee?? We LOVE nyc and everything to do but this studio is very MEHHH!! Definitely a great value for the money. There are always things that could be better but for the price and the location, this is tough to beat. Thanks!! The studio was clean in an excellent, central location, very close to Starbucks! I arrived after office hours, and the doorman had the apartment key for a simple, smooth arrival. We had a great stay at this apartment. We were a group of 6 on girls weekend. 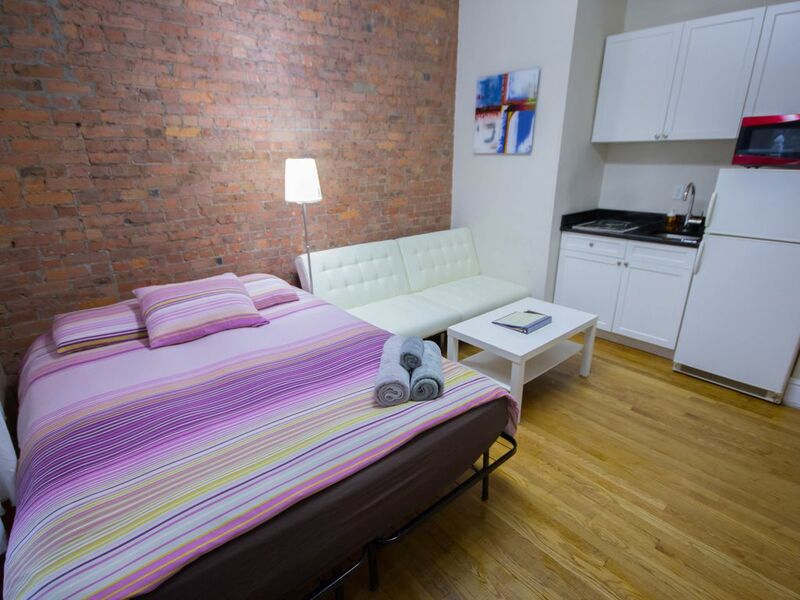 The apartment was in a great location in a beautiful, quiet and safe building near chelsea market and great restaurants with a market right on the corner. The apartment looks just like the pictures, but is smaller than it looks (typical of NYC) Furniture was great, even beds were comfortable. Everything worked just fine. Bathroom is TINY and a little dingy but was pretty clean. My only critique is that the apartment is sparse. 6 coffee cups, 5 wine glasses and a few dishes and silverware, 1 towel per guest with no spares. We had to request a sponge, extra toilet paper and paper towels and the host brought them immediately. Only problem all weekend was the actual check in procedure. We were locked out at our arrival time but the host arrived within 10 minutes to solve the problem. I would book this apartment again! clean. cozy. great location. one small improvement would be the check-in procedure. it was a little confusing, but James was a great host and very responsive. i would definitely come back. Great and convenient location, just steps from 14th Street subway. The description of the apartment was very accurate. The communication and information from the host ahead of our stay were perfect, well organized and timed - everything during our stay worked. The apartment is - New Yorkish - very small, but our family of 6 fit in ok. The apartment shows some wear and tear, but in line with what one would expect in NYC. The kitchen / living area is very small - don't plan on having a full size dinner there with 6 people. However, there is a nice, large patio accessible right from the apartment which we did use for meals. Washer and dryer in the basement are very convenient.